A MULTI agency search is currently underway on the Inishowen peninsula in search of a missing Derry woman. Members of the gardai, coastguard, RNLI, mountain rescue and navy have been deployed in search of Jean McGahey. Police and the family of the missing 72-year-old becoming increasingly concerned for her welfare after he red Ford Fiesta was discovered in Buncrana this morning. 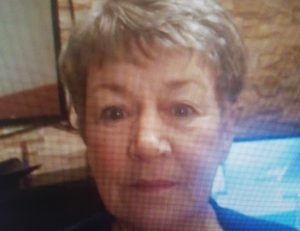 Jean was last seen in the Drummard Park area of Derry City, then travelling onto the Buncrana Road near the border crossing point at approximately 4.30pm yesterday afternoon. It is now known that she crossed the border and traveled to Buncrana. She is described as being about 5’2 in height, slim build with short grey hair. Jean is believed to have been wearing a Kaftan multi-coloured nightie, a long dark blue raincoat and gold flat footwear. Gardaí are appealing for Jean to make contact with police or her family. Or if anyone knows of her whereabouts please contact Buncrana Garda Station on Tel +353 (0) 74 9320540.